Our three horticulturists give you advice for the last cold months of winter. 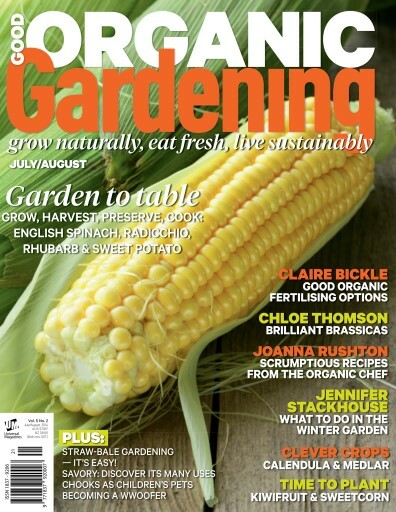 Chloe Thomson reveals all about brilliant brassicas, Jennifer Stackhouse gives the low-down on what to do in July and August as well as why she considers Calendula and Medlar as clever crops and Claire Bickle tells us all about good organic fertilising options for the garden. Ever heard of straw-bale gardening? We give you a step-by-step guide how to implement this very easy growing method that suits every type of garden – from very small to large. And we have a wonderful special feature about how to transform an unused and/or unwanted swimming pool into a wildlife pond. Again what might seem daunting is, in reality, quite easy if a few basic plans and measures are put into place. Still in the backyard, Megg Miller reveals what are the best breeds of chickens to have as pets and why they truly make great companions for children. We have a special feature about WWOOFers – Willing Workers On Organic Farms. It is becoming more popular worldwide and suitable for people of all ages. In The Grapevine, compiled by Jo Immig, we tell you about a growing phenomenon referred to as “nature-deficit disorder”. Are we afraid of nature and, worse still, are children becoming separated from the natural world? And, in our popular From Garden to Table section, discover how to grow, harvest, preserve and cook Radicchio, English Spinach, Sweet Potato and Rhubarb. Growing advice is from horticulturists Jennifer Stackhouse and Neville Donovan (Greenpatch Organic Seeds) and delicious recipes are from The Organic Chef, Joanna Rushton.